GeoGebra Dynamic Geometry: Nine Point Circle or Euler's Circle or Feuerbach Circle. HTML5 Animation for Tablets. Level: School, College, Mathematics Education. Distance learning. The nine point circle of a triangle ABC is the circle that passes through nine significant concyclic points: the feet HA, HB, and HC, of the altitudes, the midpoints MA, MB, and MC, of each side and the midpoints EA, EB, and EC of the segment from each vertex to the orthocenter. The interactive figure above, created with GeoGebra, shows a triangle ABC with the Nine Point Circle or Euler's Circle or Feuerbach Circle. To manipulate the interactive figure: tap and drag points or lines. To stop/play the animation: tap the icon in the lower left corner. To reset the interactive figure to its initial state: tap the icon in the upper right corner. To explore (show / hide): tap a check box. GeoGebra is free and multi-platform dynamic mathematics software for all levels of education that joins geometry, algebra, tables, graphing, statistics and calculus application, intended for teachers and students. 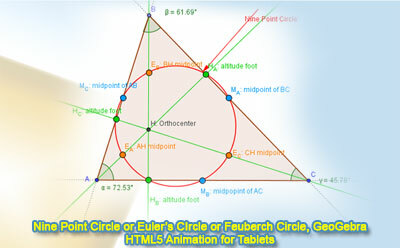 Many parts of GeoGebra have been ported to HTML5. It has received several educational software awards in Europe and the USA.